Built with breakthrough label-free Field Effect Biosensing (FEB) technology, Agile biosensors help you fully characterize and explore your interactions to make better decisions earlier. The surface of the biosensor is made of graphene, platinum, and glass – biologically inert materials that minimize non-specific binding. Agile biosensors enable accurate binding confirmations in complex samples such as solvents, detergents, cell lysate, and blood fractions because the electrical sensing mechanism is impartial to optical impediments, providing a novel, orthogonal technique to measure binding. Agile biosensors are single-sample, regeneration-capable and cost-effective, using just 10 µL of sample. A variety of biosensors offer convenient surface chemistries for your binding pair and can also be customized for unique experimental conditions and applications. See the table below to find the biosensor that best suits your needs. The Agile Super Amine-immobilization Biosensor Chip – SCOOH provides a high-density amine-reactive, hydrophilic surface for target immobilization via free amine groups. 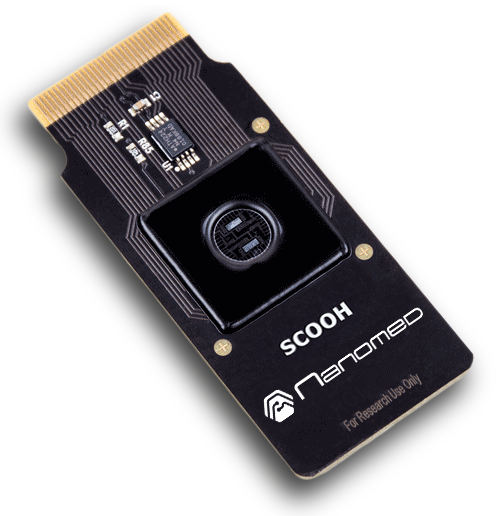 Specifically designed for high-concentration measurements, SCOOH biosensors decrease background noise caused by hydrophobic analytes. The Agile Amine-immobilization Biosensor Chip – COOH is compatible with standard amine-linker chemistry. Molecules can be covalently linked to the biosensor surface via amine groups, enabling binding confirmation for antibodies, proteins, peptides, or small molecules. The Agile Rapid Amine-immobilization Biosensor Chip – NHS has pre-activated amine-linker chemistry that enables you to immobilize your target directly to the biosensor surface. Molecules can be covalently linked to the surface via amine groups, enabling binding confirmation for antibodies, proteins, peptides, or small molecules. The Agile Carboxyl-immobilization Biosensor Chip – NH2 is compatible with standard amine-linker chemistry. Molecules can be covalently linked to the biosensor surface via carboxyl groups, enabling binding confirmation for antibodies, proteins, peptides, or small molecules. The Agile His-tag-Immobilization Biosensor Chip – NTA provides for the immobilization of histidine-tagged molecules to the biosensor surface, convenient for a majority of recombinant proteins and allowing you to control the orientation of your immobilized molecule. The Agile Hydrophobic-immobilization Biosensor Chip – FLEX provides a hydrophobic surface for customizable surface chemistry, enabling rapid immobilization of most proteins, membrane fractions, and lipid monolayers.